Wondering how to go about cooking a flank steak? Here's how you can cook this delicacy to perfection. 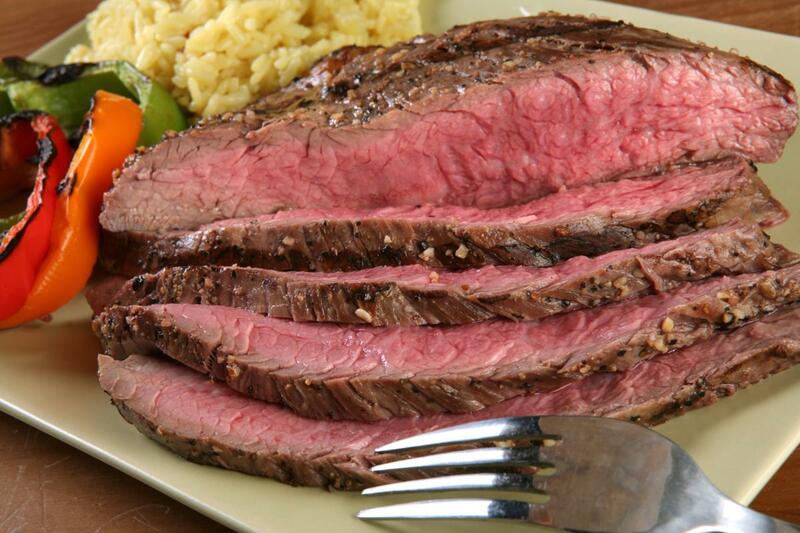 Flank steak is a chunk of beef from the flank of the animal. The fleshy part between the ribs and the leg of the cow on the side is the flank steak. It is boneless and extremely flavorful. This is a very firm blob of meat, as this area of beef is often well exercised and has much fibrous tissues. Remember, properly cooking it will ensure that it softens and becomes easy to chew as well as the fact that no portion of it remains uncooked. It needs to be marinated and cooked over high heat. Here's how to cook flank steak perfectly. Before we begin, first we need to see how to marinade it and then move on to cooking it. Though there are various marinades available in the stores for steak recipes, why not try an easy recipe at home? So, check out the ingredients required and follow the procedure to have marinated meat ready. Red wine vinegar, 3 tbsp. Step 1: Mix the olive oil, red wine vinegar, honey, soy sauce, lemon juice, black pepper, and minced garlic in a blender. The marinade is ready. Make ¼-inch shallow cuts on both sides. Brush the steak with the marinade thoroughly to make a uniform coating. Step 2: Now place the steak and marinade ingredients in a large freezer bag. You can pierce the steak with a two-pronged fork as this will allow the marinade to soak into the meat. Now refrigerate it for at least 2-4 hours, preferably overnight. Step 3: Coat the grill rack with olive oil. You need to preheat the grill over high and direct heat till its scorching hot. Step 4: Remove the meat from the marinade bag. Take coarse salt and freshly ground pepper and sprinkle it on all sides. Step 5: Now, it's time to place the steak on the grill. You need to grill it for 6-8 minutes on each side. Till the time it cooks, take chopped onions and butter. Fry onions in the butter in a skillet till they become slightly golden and tender. Remove it from the heat. Step 6: Now remove the steak from the grill and place it on a cutting board. Keep it covered with aluminum foil for 10 minutes to trap the heat. Now diagonally cut it into very thin slices. Step 7: Garnish with onion and coriander and serve. The excess marinade can be boiled for some time and served in a bowl along with the scrumptious steak. So just get all the ingredients and start with the preparation. Marinated, cooked over high heat for a specific duration, sliced, and garnished flank steak is just delightful to eat. To cook the meat, a grill is used, but in case you don't have one, you can opt for an iron frying pan as well. Here's hoping that all your doubts have been cleared.